Does Ebola Have a Free Gym Membership? Picture yourself in a group fitness class or on the training floor at your local gym. What do you see? Let me tell you what I see…sweat dripping, yelling or grunting with little starbursts of saliva escaping the mouth, water bottles being quickly picked up, sipped (and often slightly spilled) and tossed back down, the occasional sneeze or cough into a hand followed by grabbing a dumbbell, holding onto handle bars in cycling class, and holding child’s pose face down on a yoga mat that may have been sweated, coughed, or sneezed upon during the previous class. All of these fluids—sweat, saliva, mucus—that trickle out of body are considered droplets. And guess what? No need to panic. Let’s just look a little closer at what the Center for Disease Control and Prevention (CDC) specifically says about droplets and the transmission of infectious diseases, Ebola in particular. So, in summary. First, Ebola (and other infectious diseases and viruses) is spread through droplets. And second, the gym can potentially have droplets all over the place. Don’t freak out. All we need to do is what we should have already been doing in the first place. Avoid touching your mouth, eyes, and nose. See full detailed list of recommendations on the CDC website. 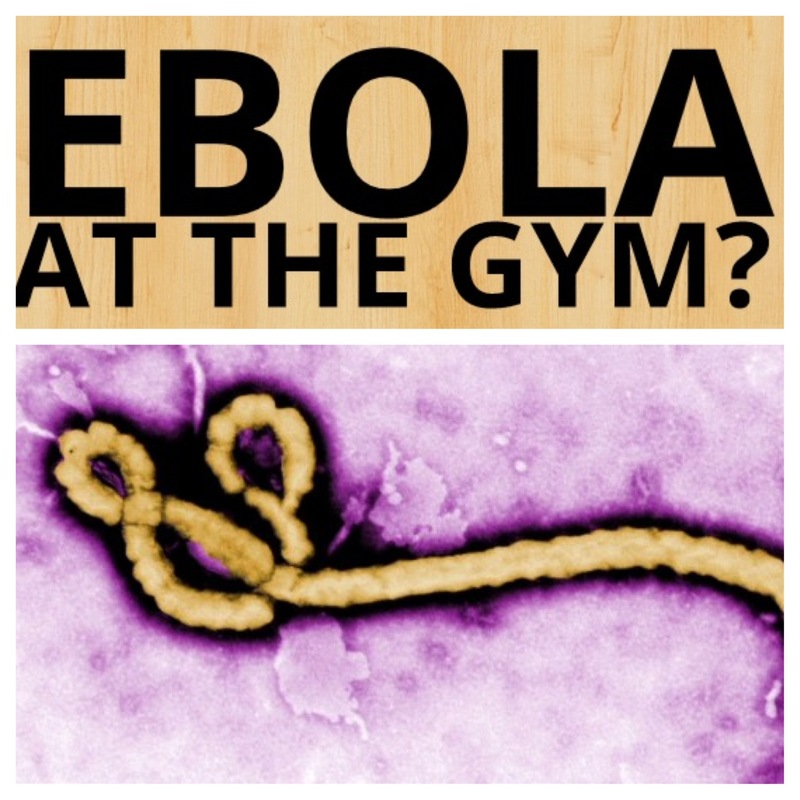 Here are a 6 tips to minimize your risk for Ebola and other viruses at the gym. Properly wrap or cover any open wounds prior to working out. Dedicate time to wash your hands after your workout and before you leave the gym. Make sure your gym has cleaning materials (preferably disposable, single use disinfectant wipes or paper towels and disinfectant spray) and you know how to access them. Arrive to group exercise class a few minutes early to properly wipe down and clean any equipment. Clean all gym equipment prior to use (and afterwards—it’s common courtesy and proper gym etiquette). Avoid close contact with anyone sick. Also, a person needs to be symptomatic in order to transmit the virus. And more than likely, if a person is symptomatic, exercising may be the last thing s/he feels like doing. Banks, S. (2014). Irrational Ebola fears make life difficult for Liberians in the U.S. LA Times. Boseley, S. (2014, October 13). How to avoid being infected with Ebola. The Guardian. Kylstra, C. (2014, September 30). Questions about the Ebola virus that you’ve probably already googled this week. Women’s Health Magazine. McNeil, Jr., D. G. (2014, October 3). Ask well: How does Ebola spread? How long can the virus survive? The New York Times. The United States, in particular, has experienced four reported, four laboratory-confirmed cases, and one death caused by the Ebola virus. Although all four Ebola cases in the U.S. were travel-associated with individuals traveling from highly impacted areas and “localized transmission” upon return, we all must take precautions to minimize transmission.